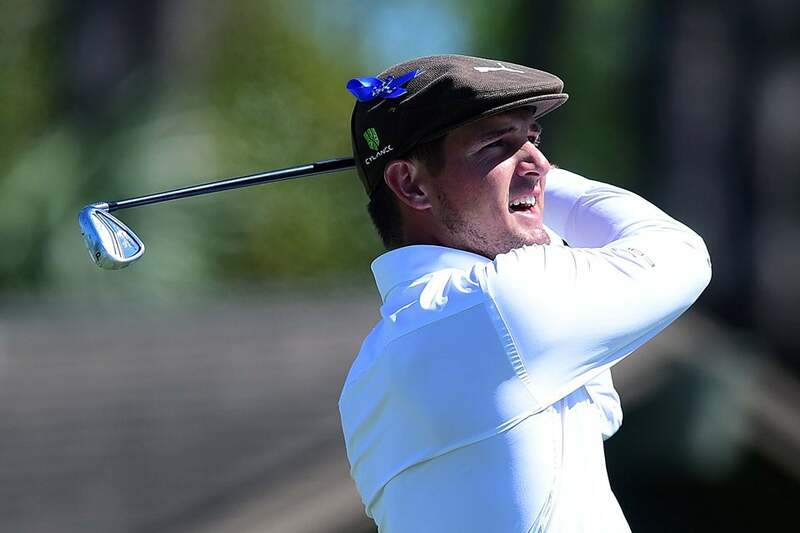 HILTON HEAD ISLAND, S.C. (AP) — Bryson DeChambeau shot a career-best 7-under 64 on Friday to take the lead into the weekend at the RBC Heritage Classic. DeChambeau’s first event as a pro was at Harbour Town Golf Links in 2016. Two years later, he posted his lowest ever on the PGA Tour to get to 10-under 132, one ahead of red-hot Ian Poulter and Si Woo Kim. Poulter showed he’s not done playing high-level golf with a bogey-free 64. Kim, The Players Championship winner, had a 65 that included a two-shot penalty for touching sand after a bunker shot. Two shots behind DeChambeau were Chasson Hadley (68), past RBC Heritage winner Brandt Snedeker (64), Luke List (64) and first-round leader Rory Sabbatini (70). World No. 1 Dustin Johnson shot a second straight 69 and was tied for 26th, six shots off the lead. DeChambeau, 24, jump started his round with an eagle on the par-5 and took over the lead with birdies on the 13th, 15th, 16th and 17th holes. He made a knee-knocking, 12-footer for par on the 18th hole after his approach landed in a front-side bunker. DeChambeau pumped his fist when the ball curled in, as pleased with his improved putting as his composure at rallying late to the lead. “Two years, it’s time,” DeChambeau said. He won for the first time on tour last summer, shooting a pair of 65s on the way to taking the John Deere Classic. He’s had three top 10s this season, including a second last month at the Arnold Palmer Invitational. DeChambeau’s certain his play at Harbour Town is simply the next step in his progress to the top. “I’m figuring out a lot of great things that are helping me on the golf course,” he said. Poulter’s learned plenty the past few weeks. He was the talk of golf two weeks back with his stunning playoff win at Houston Open where he made a 20-foot birdie putt on the 72nd hole to force a playoff, then beat Beau Hossler on the first extra hole to gain entrance to Augusta National. After an opening 69 at Harbour Town, Poulter put on a dazzling second-round, bogey-free display. Poulter briefly took the lead alone with a 16-foot birdie on the par-3 seventh. He had a chance to reach 10-under, but lipped out an 8-footer on his final hole, the ninth. Poulter has shot five sub-70 rounds in his last six times around Harbour Town. Even more remarkable than Poulter’s play may have been Kim’s scoring. He posted nine birdies along with a triple-bogey 6 on the par-3 14th where he was assessed a two-stroke penalty for touching the sand when he scrubbed the fringe of a bunker following a shot. Kim quickly erased the error from his mind — and the scorecard — with birdies on the next three holes to regain his lost shots. Much of the field thrived in mild, sunny conditions where even the course’s typically difficult closing stretch of No. 16, No. 17 and No. 18 along windy Calibogue Sound played much tamer than a typical round. Japan’s Satoshi Kodaira followed his 73 on Thursday with the lowest round of the tournament so, a 63, on Friday. Michael Kim went from an opening 76 to 66 in the second round. Dru Love, the son of five-time RBC Heritage champion Davis Love III, improved 11 strokes from his first round with his 66 on Friday. In all, there were 53 rounds in the 60s among the 130 players who competed Friday. Among those missing the cut were Paul Casey, Marc Leishman and Tyrell Hatton, all ranked among the top 20.